That also happens to be the students’ favorite type of weather, aside from snowstorms which result in days off, or delays, of school. 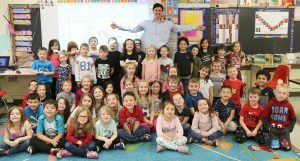 News Channel 9 meteorologist John DiPasquale, back center, surrounds himself around several excited Lanigan Elementary kindergartners during a recent visit to the school on the heels of their academic unit on weather. They shared that information, and more, from their classroom “weather stations” during a special visit from News Channel 9 meteorologist John DiPasquale at the tail end of their academic unit on weather. In preparation for the visit, the kindergarteners created a welcome sign, complete with the meteorologist’s photo and Lanigan’s Positive Behavioral Interventions and Supports initiative core functions of being respectful, responsible, safe and a problem solver. Outside of the kindergarten classrooms, DiPasquale also was greeted with artwork and writing about what meteorologists do and raindrop crafts where students expressed additional weather favorites. Teacher Joseph McNamara said the students had spent much time observing various types of weather and recording their findings. As part of the academic unit, they also learned about weather symbols, temperatures, precipitation and roles of meteorologists, among other highlights. Santiago Rodriguez was excited to share with DiPasquale that he knew water freezes at 32 degrees Fahrenheit. During the visit, students received a virtual tour of the News Channel 9 television studios, complete with a full explanation of how weather segments are composed. “Woah, that’s really cool!” one student shouted. The kindergartners asked DiPasquale questions about his job, the studio, required equipment and weather before he showed them a vortex experiment with two connected two-liter bottles, water and the importance of force.